This is another area where I have failed to find any coherent set of useful appable tools. If you have any ideas, please let me know. In terms of efficiency, an ideal polymer has a high ξ value - it likes to form a rigid pallisade extending over long distances, giving small curvatures and large radii. Polymeric and oligomeric surfactants can be wonderfully efficient in this regard. Although they have high MWts which, in earlier sections, were shown to be bad news because you get fewer surfactant molecules per added gram, a lot of their MWt can be cheap, simple polymer, so they can be very cost effective. So why don't we exclusively use polymeric surfactants? The answer is the old problem of kinetics versus thermodynamics. If you can get the polymeric surfactants to the interfaces, then thermodynamically they are wonderfully efficient. However, precisely because they are such large molecules they take a very long time to get to the interface, so they are kinetically challenged. This means that in practice they are little used as primary surfactants. They tend to be used in small levels for special effects such as avoiding re-deposition of soil during cleaning. If the polymeric surfactant gets a chance to wrap around an oil drop (removed via a faster-acting conventional surfactant) then its kinetic slowness is an advantage if the oil-plus-polymeric-surfactant bump into the solid surface. The question of surfactant diffusion to an interface (though it's the water-air rather than water-oil interface) is covered in the Dynamic Surface Tension app. The slow kinetics of polymeric surfactants make them very challenging in terms of measuring their Cc values. Even for normal surfactants it can take some hours or days for phases to separate in order to analyse the scans. 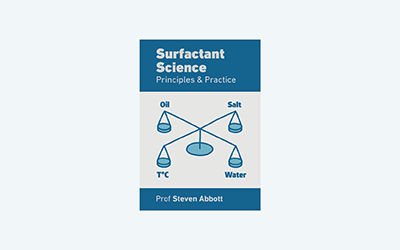 For polymeric surfactants those phases may never separate - just shaking the oil/water/surfactant mix is sufficient to lock the system in a thermodynamically unstable but kinetically highly stable state. Of course, these scans need a high percent (5-10%) of surfactant for meaningful measurements, and such high percentages are not typical of polymeric surfactants in normal use. The sad fact, therefore, is that a lot of formulation with polymeric surfactants is formulating in the dark, relying more on kinetic effects than on any subtleties of design. The above discussion is more to do with the HLD-NAC aspects of surfactants. But polymeric surfactants excel in at least 2 different ways. Super-low cmc combinations: The right combination of polymer and ordinary surfactant can lead to a remarkable reduction in cmc. The question of why you want a reduced cmc is another matter - in many cases it's not the primary concern. However, if you want a low cmc then the right polymer can attract the surfactant to itself, leading to an early "virtual micellation" and, therefore, a low cmc. Emulsion steric stabilisation: standard DLVO theory (see, e.g. DLVO app) shows that particles or emulsion drops can be stabilised by a long (δ=5-10nm in the DLVO model) polymer chain that fully extends (its Χ value is <0.5, i.e. it is in a good solvent), provided the polymer fully covers the drop (Γ is high) and is strongly anchored to it. Naturally this implies block co-polymers where the hydrophobic block is strongly attracted to the oil and the hydrophilic block (usually PEO) likes being fully extended in the water. The DLVO app also discusses charge stabilisation which can also be accomplished by charged polymeric surfactants, with the complication that the stabilisation is strongly dependent on the presence of, say, added NaCl. High elasticity: For foams a highly elastic surface can make them really strong and resistant to degredation. This can be accomplished by simple additives such as lauryl alcohol to SLES foams. But polymeric surfactants can make the foam surfaces super-strong. This can be desirable (for fighting fires) but can also be a nuisance side-effect of traces of polymeric surfactants added for other reasons. Such foams are strongly resistant to classic antifoam activity (such foams provide a very high "entry barrier"). These issues are discussed in the Foams section.